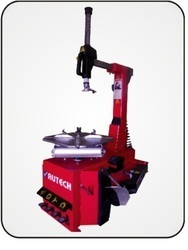 We have gained reputation as a manufacturers and suppliers of Automatic Tyre Changers. These are developed from supreme materials and are known for high efficiency, strength, durability and long working life. These are used in different automobile industries, customized to suit clients’ needs and provided at industry leading rates. Max. Rim Diameter 11" -24"
Pneumatic back tilting post, vertical and horizontal arm can be locked pneumatically at the same time. Larger and thicker turntable, dismounting 11" -24" rim and max. Tire diameter 1100mm. Taller vertical arm, dismounting max. tire width 330mm. 40A reverse switch .silver point, which can bear more pressure and work for a long time. The hexangular shaft is made of S41, which can avoid the distortion and error when operate the 11"-24" stiff tire. 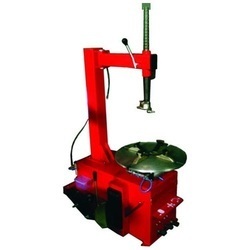 Foot pedal is made of high quality steel material which can work for a long time. 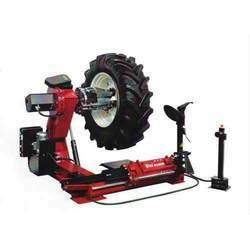 Looking for Automobile Tyre Changer ?